McAfee Avert Labs Blog posted last friday (25th August, 2006) about a Phishing attack, that is started by an SMS on your mobile phone. This may not be a direct security threat for your Mobile phone, but a severe threat for your desktop/laptop computers and network that you are connected to. The attack starts with an SMS on your mobile phone indicating that you have signed up for a dating service and you will be charged $2 per day unless you visit a URL and cancel your subscription. And for many this looks like a real SMS. So when you visit the URL, the website will prompt you to download an application which is a Trojan horse that makes your computer a zombie, and exposing it to hackers. If you don't find any thing on Google but you are still suspicious, better not to visit the website. If you are aware that your Dating service used to send SMS messages to remind you of your subscriptions, You can call up the Dating service or relevant service provider, and confirm your subscriptions just to make sure every thing is fine. If your dating service never sent you SMS reminders about your subscriptions, you can fully ignore the SMS. And particularly, DO NOT ACCESS such URLs from your office network. If the hackers succeed to have you install the application on yourÂ office computer or your personal laptop accessing office internet, the consequences will be severe. A life style apart. On 8th of August, 2006Â Alltel Wireless, one of the top US Wireless operators in association with Melodeo launchedÂ Axcess Mobilcast service that enables Alltel customers to listen to podcasts on their mobile for a monthly subscription price of $3.99. Users can not only get main stream podcasts from the likes of NPR and CNN but also podcasts from independent podcasters around the world. At the time of release, there are around 2500 podcasts were available with the Axcess Mobilcast repository at users disposal. More details at Alltel Wireless web site on Axcess MobilCast here. Note that Alltel is still following a walled garden approach, meaning that Alltel users can not listen to whatever they like, but what ever is available. The number 2500 podcasts looks good,Â but if its not in that list, then you can not listen to. Many still ask the same question,Â why would one pay $3.99 to listen to podcasts on mobile? and quite skeptical about the service. They think we have an iPod to do so.Â Ofcourse, you can carry an iPod for music, PDA for organizer, portable TV for watching clips ..........., didn't we warn you that still many don't understand 'The Cellular Life Style'? In year 2001, the Japanese Wireless Operator NTT DoCoMo started offeringÂ world's first 3G service.Â Most of the world was very skeptical about the success ofÂ 3G networks.Â Analysts declared it as the most riskiest endeavour ever taken by any wireless operator in the world. MostÂ questioned why would anybody buy an expensive handsetÂ and play with a new interfaceÂ with an unknown technology and an equally unwanted application. Not many had an internet connection to their computers, and why would some one need an internet connection on the cell phone. Most probably you are not an exception. You might be just one of them askingÂ similar if not same questions.Â Why would any body want to use Mobile to access internet? What the heck is about ringtones? And the rest is history.Â Â We believe, it is by far the most memorable and defining parts in the history of Mobile.Â Today,Â We assume that most of you haveÂ some sort of answers to most of those questions.Â NTT DoCoMo and its spectacular "i-Mode" have successfully created a new world of Mobile users, who love to do every thingÂ on their Mobiles.Â Â Right from accessing email to paying billsÂ at a shop. Along the way, they have completely changed, what people call the traditionl way. For example, most people in Japan even stop wearing watches, almost an 100 years tradition.Â They started using Mobile as their watch, timer, calendar and organizer. That is just a simple example of how Japanese redefined their lifestyle around the Mobile. We call it The Cellular Life Style, a life style apart. Some love to call it Mobile2.0. We don't argue. So, the question to be asked at this moment is, "Are you ready"Â toÂ be part of the revolution,Â and create a new life style? Or just stay comfortable reading a similar story again in 2010? If you are ready or willing to be one, then Welcome to 'The Cellular Life Style',Â a blog that will connect you to the Blazing new life styles of the Cellular world with reports, analysis, commentaryÂ and reviews about the Key Trends, Technologies, People, Companies, and Cool little gadgets that are redefining the Cellular Life Style. Just not what is available but howÂ it can help you redefine your own life style around it. So, here we are,Â attempting to beÂ your preferred source for latest and relevant informationÂ in the MobileÂ World. On the way,Â Â aspiring to help you redefineÂ Your Cellular Life Style.Â We will cover the latest features, offers from carriers, gadgets, applications and give you a fair and informative look at the buzz in the Mobile Data World. Hope you will enjoy the journey and be part of the revolution. If you have some cool stuff to share with us, please emailÂ inspions@gmail.comÂ or submit as comments on this blog on a relevant post. You can subscribe to the RSS feed or subscribe by email (scroll down to the bottom of the screen). You absolutely have the right to choose !Â We respect your choice. Its your style, by all means. Guy has posted a video of a panel discussion with 5 top Silicon Valley Entrepreneurs on "Startup Success" moderated by him at Churchill Club on 17th August, 2006. It does not have formulae or checklist for success, like the recent main stream media/magazine cover stories, but it got some great and genuine insights in to the topic. When it comes time to sell a house, some homeowners rely on a statue of St. Joseph. A centuries-old tradition claims that burying a statue of St. Joseph in the yard helps homes sell faster. Getting out of bed with left foot first brings bad-luck. Spit on a new baseball bat before using it for the first time to make it lucky. Friday, 13th is the most dreadful day and bring misfortune. Also, If 13 people sit down at a table to eat, one of them will die before the year is over. How you start the year is how you will end it. While predicting the baby, If Your baby's heart rate is 140 beats per minute or less, then it is a boy. If 140 or more beats per minute then its a girl. It's good luck when you see a falling star. Make a wish on it and it will come true. 2 cents ( Rs.1) per minute to make international calls to US, Canada and Europe from Andhra Pradesh, India is quite irresistible !! All you need is a broadband connection and phone unit. Visit the service website, 'Matallo' for more information on rates and information about plans available. Calls to other states in India is not yet approved and provided by Nettlinx at this time as per the news report. Hyderabad-based Internet service provider Nettlinx, in association with Smart IMS, a US-based corporation is coming out with its VoIP services across Andhra Pradesh under the brand name of â€˜Matalloâ€™, which means â€˜In Wordsâ€™ in Telugu. Under the new initiative, Nettlinx will provide VoIP services with the help of special â€˜Matalloâ€™ VoIP phones that will enable the users to communicate to various international destinations via the IP network of Nettlinx, according to Manohar Loka Reddy, director of Nettlinx. The company will be rolling out various models of phones such as â€˜Matallo Homeâ€™, â€˜Matallo Enterpriseâ€™ for voice and also â€˜Matallo Videophoneâ€™ that offers a high-clarity video stream helping the callers to be over a video call and also conduct video conferences. The company is looking at a subscriber base of between 50,000 and one lakh in the first year. It expects to expand up to 8-10 lakh subscribers in three years. While the company charges Re 1 (2 cents) per minute for long distance calls to the US, Canada and Europe, it offers phone-to-phone calls free of charge. What you must learn at School? Guy Kawasaki has a wonderful post 'Ten Things to Learn This School Year' (actually 12 things) explains the most important things that one must learn at school. They are some of the most valuable things, one must learn to succeed in the real world. For an aspiring entrepreneur, they are MUST learn things. Unfortunately, none of them are taught at school. One must make explicit and deligent efforts to learn them on thier own. One more important aspect, and the most valuable asset in real life (I guess Guy missed) is 'experimentation' and 'application' of what you learn. Schools teach you to study, review, analyse and present. But never explicitly make you to apply what you learn, experiment and try out. This is quite a serious issue with educational institutions in India, right from a rural high school to IITs. And most schools teach you to 'conform' to rules of the game. Do what I say kinda conventions, Never allowing or encouraging original, new and/or radical thoughts. So one must also learn to be their ownself without worrying about compliance to norms. What about creating your own norms for that matter? This is another issue in India, where social peer pressure is so immense that many are frightened to stand out. That reminds me of a great movie, 'The Dead Poets Society'. India Online Growing Fastest ? Yes and No ! Thrilled to see this head line on Google news. While it is a wonderful news that Indian internet population is growing at the fastest rate, it is not a good indication to compare growth. According to a survey conducted by US-based Internet firm, comScore Networks, India's online population is growing at the fastest rate in the world. While the growth rate is quite impressive and highest in the rankings, number of net users added is quite small comparatively. Since the growth rate is measured and expressed as a percentage of current users, this can be misleading if we don't take into account the current user base. US has 153 Million internet users. So even though US has only 1% growth rate, that would mean a net addition of 1.53 Million users. India has achieved a growth rate of 7.8% which is at the first look 8 times the growth of USA. But the net addition of internet users in India for the same period of comparision, it is only 1.31 Million users, which is less than US net additions. So it is quite misleading to say that India is growing fastest. Some times rate or percentage expressions will be quite blinding. Also, the report says that it has excluded people who access internet from public computers and internet cafes. In India, cyber cafe is the most prominent place where people access internet. So, if we exclude those numbers, this can not be an accurate indication of how many Indians are really accessing internet. Also, it excludes those aged below 15 years, the most important segment of Computer literates in India. The number will definitely be much higher than 18 Millions, if we include those numbers. I guess it would be more than double of that number, around 50 Million. SmallBizResource.com article "Six Mobile Innovations That Will Change Your Life" reports the following 6 Mobile Applications or concepts as Life Changing innovations in the Mobile world. Windows Live Writer - WOW !! Lovely. I saw a post on GigaOM talking about Windows Live Writer, and with all my frustration with the current tools, I immediately downloaded the tool to see what they got. The very first minute, I started using it, I fell in love with it. Huge WOW! I have used w.blogger in the past. And then Qumana looked little better. But Windows Live Writer just rocks!!!. I loved it the first minute. The coolest feature is true WYSIWYG feature. The tool understands the styles that you have on your blog and show the post using those styles right at the moment you are editing. No more publish, view, and edit the posts. You are guaranteed that in the true sense, What You See Is What You Get on your blog. Simple, clean, just like any other Microsoft product it got an Intuitive user interface, and a special big WOW for WYSIWYG !!! You can download from the its blog Windows Live Writer here. On 2nd August, 2006, CSE(Center for Science and Environment) released nationwide study on pesticide contents in soft drinks across India. The comprehensive study covering 12 states found dangerous levels of pesticides in all samples of soft drinks tested. Pepsi and Coke accounts for around 80% of Indian soft drinks market. Read the full CSE Lab Report(pdf) or read this presentation that gives complete picture of this issue right from the beginnings in Aug, 2003. Here is a graphical representation of the pesticides content in the samples. The green line at the bottom, dampened by the overpowered towers of pesticides is the acceptable level. After the report was published, so far six states have completely banned colas (Coke and Pepsi). Many state governments ordered the ban of these soft drinks in Government offices, schools and areas surrounding schools. Uproar by NGOs and Communities to ban colas completely till they prove clean. As usual, they are finding faults at the methodology used by CSE, which is the United States Environment Protection Agency (USEPA) methodology. They blatantly claim that their colas are safe. Those limits are not yet LAW in India. So they don't have to comply as per LAW. They have not decided yet whether to comply with the Supreme court order to reveal ingredients in 6 weeks. Claiming that "The Coke you drink in India would be as clean as the Coke you get in Paris"
They see it as a communist oppression of western businesses as it happened in the past. Indian Business leaders are worried that this can affect foreign investments, as it might be seen as 'against' western business outfits. CII, Kiran Pasricha, the US head of the Confederation of Indian Industry (CII).Â 'I see it as local politics in the Indian context. Investors have to see the bigger picture. We hope that better sense will prevail,' she said. 'This kind of action is a setback for the Indian economy,' Undersecretary for International Trade Franklin Lavin told Agence France-Presse. I believe the pesticide content is mainly due to the water used in the bottling plants. Not because of the recipe of the colas. So all other food products and bottled water will contain similar levels of pesticides in them. Colas are widely used soft drinks than other forms. So whether other products have or not have pesticides, colas have to sell cleaner products. Cola companies, if you are clean,Â prove it. We don't want to read/hear your crappy press releases. Enough crap already. We want a clean coke or NO coke. Prove it if you are clean. Also, CSE must prove that the water being used in the plants does not contain any pesticides. That will clearly close out on issue with cola's recipes. CSE must continue with similar tests on bottled water, if the water is contaminated in the first place. Indian business outfits and organizations must put health of Indian community first before their business obligations, and stop speaking crap and creating unnecessary tensions among the investors. I know it is asking for a lot from greedy business men, but hey, you have a business interest too. So do what is good for your business. Bring the colas clean. Give a clean cola or shut down the colas and show that you are committed to public safety. That would attract a hell lot of investors. 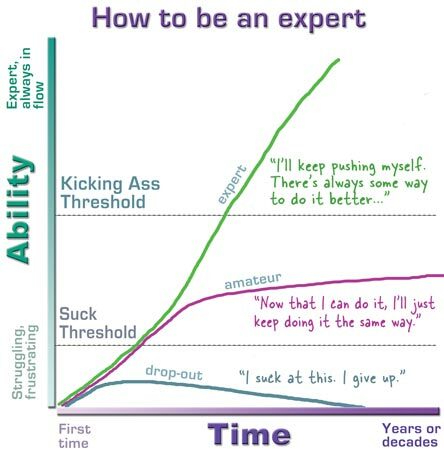 An inspiring post from "Creating Passionate Users" blog , Â How to be an expert declares that Any one can become an expert if we just put in the time and focus on what we want to become. And its never too late to do so. So, no excuse for not being an expert at any point of time in your life. When you hear the word 'outsourcing', which country comes to your mind? I bet, it is India. India in the last few years became synonymous with outsourcing and painted a huge colorful picture of itself on the world map because of outsourcing. And recently, India upgraded its image as the Innovation pool and buzzing with 10s of startups incubated every other month. But in a record deal of $100 Million over the next 7-8 years, India's own Bharti (Airtel brand), the largest private Mobile operator in India, outsourced to IBM to provide better Content delivery platforms targeted for Indian audience. Read more at Reuters press release and an IBM Case Study (an interview that includes Sunil B.Mittal, Bharti's Chairman. Though Akhil Gupta argues in the interview (IBM Case Study) that IBM is as much as in Indian company, I do not fully agree. If that is how we define, then every global company, for instance Adobe,Â Dell, Microsoft, Google, YahooÂ and likes which have R&D centers in India are Indian companies. Nah! Thatz not the point. Bharti relied on some thing in IBM that is clearly lacking in India's own IT companies like Wipro, TCS, Infosys and likes. "Because there was some criticism that, while the world is looking for outsourcing to India, we have done the opposite. And our answer to that was, first, we don't treat IBM as a pure U.S. company. IBM, with 10,000 plus people in India, is as much as an Indian company. After all, when they are expanding in India, they are employing Indians. Two, we have gone for what meets the necessity of the needs of our company. And if that is IBM, so be it"
There has been a growing criticism about Indian IT companies that they are ignoring domestic markets and excessively focusing on US and European markets. And this news of Bharti outsourcing $100 Mil to IBM will sure prove the point of the criticism. India's own IT technology services/product firms, are you listening? IBM is winning the deal in your own court. Where is your strategic advantage of being an Indian company with all that innovation, differentiation and pioneering execution models. For sure, it creates a clear dent in the image for India's own IT Companies. And to a greater extent, it substantiates the opinion that it is better to have your own development center in India than outsourcing to Indian IT companies. Fitch Ratings on Monday unexpectedly raised Indiaâ€™s sovereign foreign and domestic currency ratings to investment grade, citing progress in the fiscal consolidation process, a â€œstrong external balance sheet and an impressive growth storyâ€ as key factors prompting the upgrade. With Moodyâ€™s already rating India as investment grade and with Standard & Poorâ€™s ranking it just one notch away from prime status, with a positive outlook, the news will be a fillip to reformers in New Delhi arguing for faster progress towards full capital account convertibility. Read the Financial Times full news article here.